● Harvick started third and finished third, earning eight bonus points. ● Started third but lined up fourth behind his Stewart-Haas Racing (SHR) teammates after taking the green flag. ● Took advantage of caution and pitted his No. 4 Jimmy John’s Ford Fusion for fuel only on lap 12. ● Was third for the lap-15 restart, but he grabbed third place from teammate Aric Almirola after one lap. ● Pitted for four tires and fuel at the conclusion of the stage. ● Harvick started fifth and finished first, earning 10 bonus points and one playoff point. ● Took advantage of caution to pit for fuel only on lap 64. Came off pit road in first place. ● Led laps 65-68 and then laps 70-110. Kyle Busch made a bid for the lead on lap 69 before falling back. ● Harvick started 12th and finished 28th. ● Caution period beginning on lap 136 allowed Harvick to pit for right-sides tires and fuel on lap 138. Came onto pit road in third place and left in third for lap-142 restart. 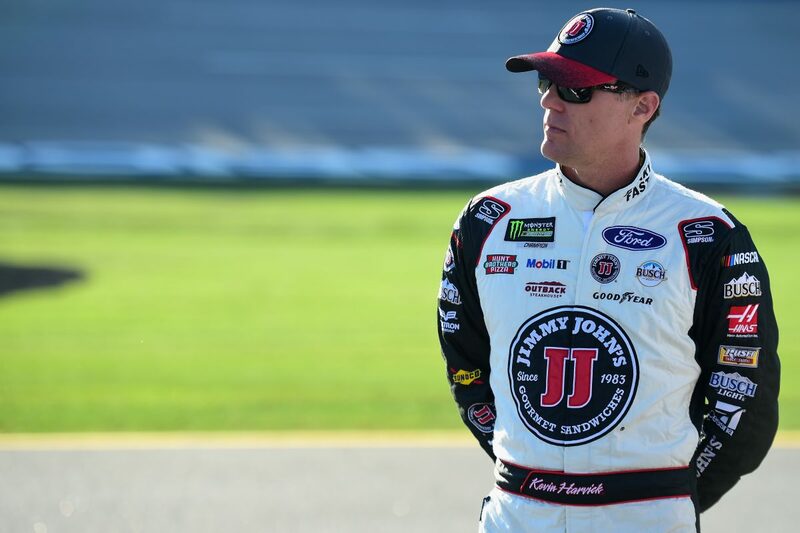 ● All four SHR drivers were able to line up on the inside for the restart, with Harvick rising to second behind leader and teammate Kurt Busch. ● On the lap-165 restart, Harvick dropped one spot back to third as teammate Clint Bowyer fell in line ahead of him to take second. ● The field remained single file until a caution on lap 187 forced overtime. ● As the field came to the green flag for the restart, Harvick peeled off the track and pitted for fuel. ● The stop dropped him to the middle of the field, and the race finished under green with Harvick in 28th. ● Harvick led twice for 46 laps to increase his laps-led total at Talladega to 259. ● Almirola won the 1000Bulbs.com 500 to score his second career Monster Energy NASCAR Cup Series victory, his first of the season and his first at Talladega. His margin of victory over second-place Clint Bowyer was .105 of a second.